Mourners from near and far, and all walks of life and various creeds, filled the Cathedral of Mary Our Queen in Homeland March 28 for the funeral Mass of Cardinal William H. Keeler, 14th archbishop of Baltimore. 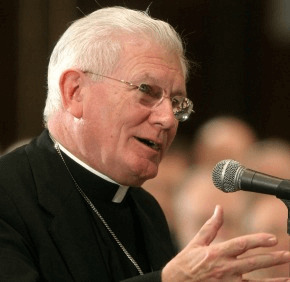 Thirty prelates, including six cardinals, and dozens of priests and deacons mourned Cardinal Keeler, who died March 23 at 86, and commended his soul to God. While a churchman of the highest stature, to be sure – Baltimore Archbishop William E. Lori in his closing remarks ranked Cardinal Keeler among the most illustrious of his predecessors, including Archbishop John Carroll, Cardinal James Gibbons and Cardinal Lawrence Shehan – many came to Cardinal Keeler’s funeral to remember a man who had simply never forgotten them. “I said, ‘Here’s a big fan of yours,’ and the cardinal held his (zucchetto) over Tommy’s head and we took a picture,” she said. Mary Lou LaMartina, a parishioner of St. Agnes in Catonsville, recalled two very young children from her parish who were sometimes brought to daily Mass at St. Martin’s Home for the Aged in Catonsville after Cardinal Keeler retired there. Over the years, Rabbi Ingber and Cardinal Keeler continued their correspondence and visits, and the rabbi came to see the cardinal, when his health was failing, at St. Martin’s Home for the Aged. In the first reading, Moses exhorts the Israelites to “love the Lord, your God, with your whole heart, your whole being, and with your whole strength” (Deut 6:5). “But you, be self-possessed in all circumstances; put up with hardship; perform the work of an evangelist; fulfill your ministry” (2 Tim 4:5). The sisters received a standing ovation. The archbishop also reflected on the last four or five years of Cardinal Keeler’s life, drawing a parallel between it and the “grand silence,” a former seminary tradition which called for silence from 9 p.m. every evening until Holy Mass was celebrated the following day. “Over these last four or five years, nature gradually imposed on Cardinal Keeler what we might term a ‘grand silence,’” the archbishop continued, adding that, though it was a “heavy cross,” he was “impressed by the cardinal’s silence, for even in his silence, William Henry Keeler maintained a beautiful dignity” rooted in his person and manifested in his friendships and care for the church. A funeral procession brought his remains to their final resting place, the Baltimore Basilica. To see more photos, visit our SmugMug page here.